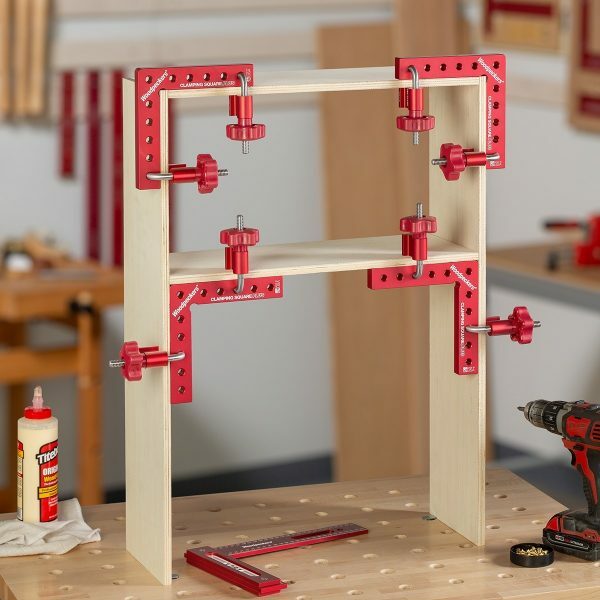 For many years I’ve used 90 degree, plywood, clamping jigs to help me align casework, perform dry fits and help me keep casework square during glue up. 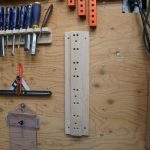 These plywood jigs, with the help of two clamps, worked great but the jig only worked on inside corners, and the clamp bars are always in the way. 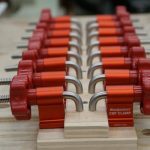 I recently got a set of Woodpeckers Clamping Squares Plus and CSP Clamps. 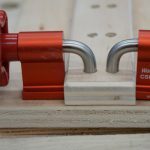 The clamps are CNC machined out of one solid chunk of aluminum to a tolerance of ± .0255 degrees! 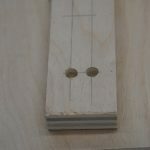 The squares measure 1-1/4” wide, 6-3/4” long, and 3/4” thick. The squares also have an inside corner “relief cut,” that won’t bind on your stock if something is cut just a wee bit out of square. 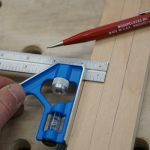 The Clamping Squares Plus work nicely on inside and outside corners. 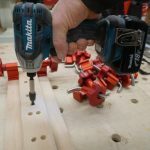 They work amazingly well at keeping large casework and panel projects perfectly aligned while you install fasteners, dry fit or perform a glue up operation. 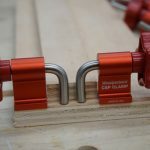 Woodpeckers new CSP Clamp or “F” or “C” style clamps. Sleek, good looking and super functional – that’s my first impression on the CSP clamp. 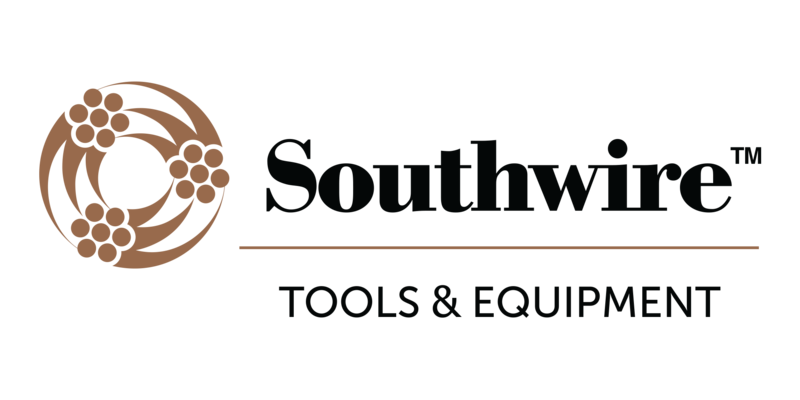 They are designed to be used with 3/16” up to 2” thick stock and the clamp indexes perfectly into the Clamping Square holes. 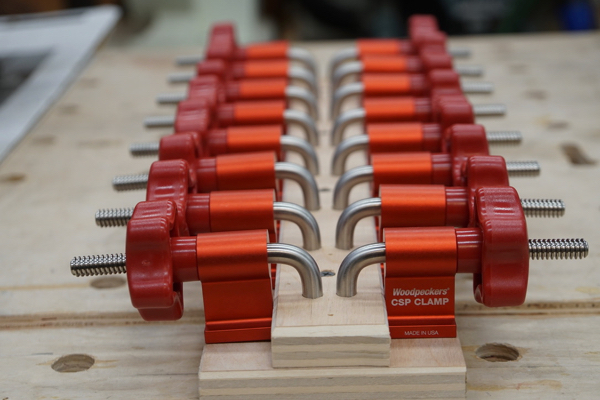 When paired together, the Clamping Squares and CSP clamps are like Batman and Robin. 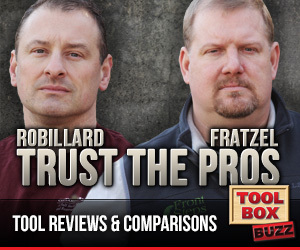 This Dynamic Duo will get your case work projects together faster, easier, and more accurately! 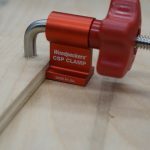 The CSP clamps have large, easy-to-grip knobs that tighten and extruded aluminum clamping jaw against the wood. 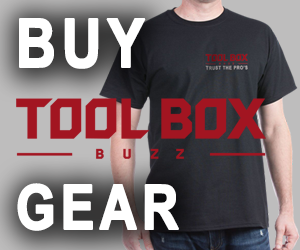 The knob operates smooth and fast, and the clamping pressure with the non-marring clamp jaw works amazingly well. 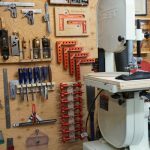 Once I received my 8-pairs of Clamping Squares I mounted them on my shop wall with screws, two 3-inch screws for each pair. 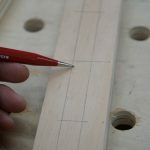 For esthetics I stepped down and over each pair the thickness of the Clamping Square. The result was a pleasing angled spacing. My dilemma was how to store the CSP clamps. 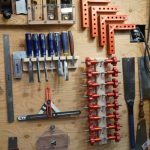 I didn’t want to toss them in a drawer, thats just plain messy, and difficult to access, so I came up with a wall rack idea. Spacing two CSP clamps opposing each other I was able to determine that a 4-7/8 x 2o inch” board was large enough for 16 CSP clamps. 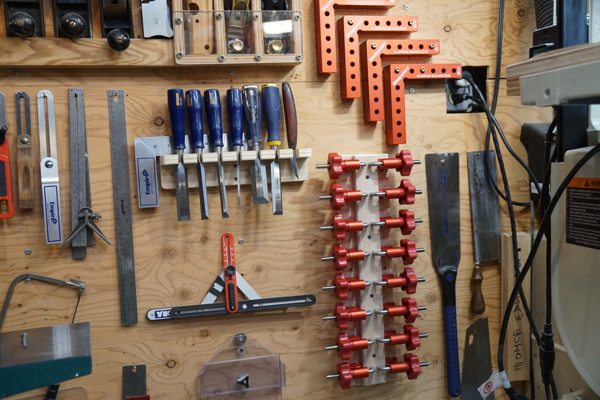 In the center of this board I mounted a 3/4 x 2-inch wide strip. I then spaced out 3/8″ holes in pair of two. 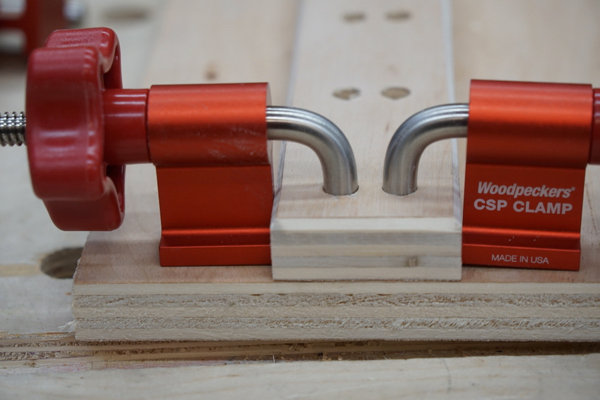 The 3/8″ hole allows the CSP clamp to index into and then clamp to the 2-inch board. The result was a neat, organized, secure and easily accessible CSP storage rack. 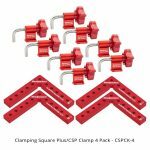 The Clamping Square Plus Clamp and CSP clamps come in different configurations. Woodpeckers offers a 4 pair set of Clamping Square Plus and CSP clamps for approximately $ 209.99. 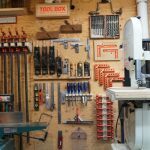 The more I use these clamps the more I say to myself, Why didn’t I think of this! 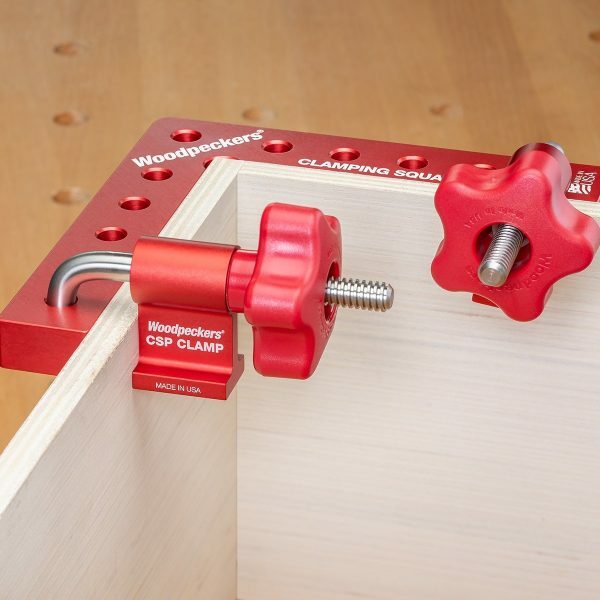 The Woodpeckers Clamping Squares Plus and CSP Clamp system has been a game changer for me making bookcases, built ins and window seats.